I get lots of questions about what's the best software for various situations. I can't answer them all, particularly as it often depends on your own situation, but I can tell you what I'm using. I'm trying to do [something] - what software do you recommend? What's the best [random category of software] program? What [software] should I buy? Those are just a few variations of a question that I get often. People frequently look to me for recommendations before spending the money or time to install a particular piece of software. Looking for recommendations and others experiences is a smart thing to do. And, in fact, you'll see I have an entire class of article categorized as Recommendations. But because I take actual recommendations fairly seriously, I don't do them as often as I'd like. So, how about I just tell you what I have installed on my machine? My original goal with this list was that it would be somewhat "incomplete" from the beginning and that I would come back and update it from time to time. That was six years ago and the article hasn't been touched since. Whoops. So much for good intentions. So consider this more of a "snapshot" of the tools that I use today. I do think it's important to clarify something; my use of the word "recommendation." I don't write recommendations for money or on request. I do get requests from various vendors, but for the most part, I ignore them. As outlined in a What does it mean when you recommend something?, I only explicitly recommend something after I've used it myself and built up some level of experience and trust in whatever it is, or on rare occasions, I'll recommend something that is in turn recommended by a trusted colleague. Recommended or not, I may use "affiliate links" when they are available for a product that I link to. As discussed in Product Reviews, Recommendations and Affiliate Links Disclosure, my use of affiliate links is completely unrelated to whether I recommend a product or even mention a product. I do, of course, take money for advertisements. As discussed in What's the difference between an ad and your recommendation?, ads should never be confused with any kind of recommendation or endorsement and that's true here and on any site on the web. These are various tools that I not only use, but for which I've written formal recommendations. Because there's really no useful order to this - there's no sense of importance or priority, for example - I'll just list them alphabetically by product name. 7-zip is what I almost exclusively to manage .zip archives, as well as its own more highly compressed .7z archives. AutoHotkey lets you define powerful keyboard macros, macros that save me a lot of time when typing. It's a bit complex to program, but as I said, very powerful. BoxCryptor is what I use to encrypt the contents of some of my folders in DropBox, keeping them secure from prying eyes even when stored online. CCleaner I don't use often, but it's a tool that eventually gets installed on all my Windows machines for those scenarios when something's not quite right and some cleaning is required. When I'm going to run a registry cleaner (which is extremely rare), CCleaner's is now the one I use first. CutePDF Writer is installed on all of my Windows machines as a key component of going as paperless as possible. I print to PDF whenever possible. DBAN isn't "installed", per se, but Darik's Boot And Nuke is something I run always prior to decommissioning an otherwise working hard drive or entire machine. Dropbox is how I keep a large amount of data synchronized between multiple machine, including my Windows, Mac, and Linux machines. FastStone Image Viewer is my image viewer of choice and I use it frequently to view not only my large collection of photographs, but also the surprisingly large collection of images used on Ask Leo! Foxit Reader is what I use instead of Adobe Reader to view PDFs. ImgBurn burns all my CDs and DVDs and is occasionally used to create .iso file images from existing CDs or DVDs. LastPass keeps track of all my passwords, securely, across all my computers and mobile devices. Macrium Reflect backs up my primary desktop machine, performing a full backup once a month, and an incremental backup every night. Microsoft Security Essentials is one of the first things that I install on my machines to scan for viruses and spyware. Process Explorer is how I keep track of what's running on my machine, and is most often used to answer the question, "OK, what's slowing it down this time?" Recuva is one of those tools that you never want to use; not because of the tool, but because of the situation that you find yourself in when you need it. I don't find myself there often, thankfully, but when I do, I turn to Recuva to recover deleted or other recoverable files first. Revo Uninstaller is another tool whose use implies that something isn't working properly. When something won't uninstall or uninstall properly, I use Revo to clean it up. SnagIt would be near the top of this list were it prioritized. I use SnagIt to create the screenshots you see here on Ask Leo!. SpinRite is something that I don't use often, but is a tool I turn to first if I suspect that a hard disk is failing. TeamViewer is a remote access solution that does the moral equivalent of Remote Desktop, only it's simpler to set up and works well across the internet. Thunderbird is my email client of choice. It's so robust and powerful that it meets the needs of both light and power users. I use it all day every day. TrueCrypt is how I keep my data, including my most sensitive personal data - secure. 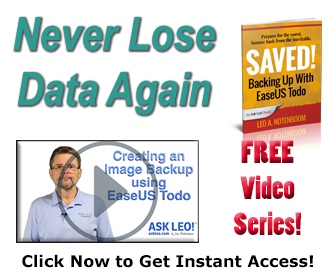 WebDrive makes ftp and sftp connections appear as virtual drives on my machine, and it's one of the ways that I upload data to and manage the servers that house Ask Leo! and my other websites. WinPatrol runs quietly in my notification area, alerting me to sensitive changes that are happening on my machine, and allowing me to block any that are unexpected or improper. This list of software includes some of the other tools that I use, perhaps daily, but that haven't written up a formal recommendation. Typically, the only reason for that is time and it in no way reflects negatively on the specific utility. While I don't consider my use of a particular piece of software an actual recommendation, being listed here does mean that I use and think well of it. Once again, the order here doesn't imply anything other than my ability to alphabetize1. Audacity is a free, open-source audio recording and editing software. I use this to record and edit my Answercasts. Calibre is an ebook creation, conversion, and viewing application. I write all my books in HTML and use Calibre to convert to various output formats. Chrome, from Google, is the web browser that I use the most these days. Camtasia Studio allows you to record videos of your screen and the activity thereon, and is what I use to record many of the videos that you'll see here on Ask Leo! and that accompany my books. CyberDuck is a graphical FTP/SFTP program originally created for the Mac. When I want to fire up something that's a little more Windows Explorer-like, this is what I'll use. Cygwin is a collection of Unix/Linux command-line tools for Windows. Defraggler is what I use when I want to explicitly defrag my hard disk. Most of the time, I'll let Windows do it automatically, but when I want to see what's happening, Defraggler does a better job of displaying what's going on. DVDFab allows me to make backup copies of my DVDs. Evernote is best thought of as a database into which you place notes. Notes can have attachments like PDF files and the like, but thinking of it as a database of notes that are automatically synchronized across multiple machines is perhaps the easiest way to visualize it. Evernote is a key component of my going as paperless as possible. GNU Privacy Guard, or GPG as it's often referred to, is the open source and free equivalent to PGP - Pretty Good Privacy - used for high quality public key encryption. HP16C is an emulator of the calculator long loved by techie types such as myself. It's biggest draw for the computer geek is that it can do everything in hex, octal, or even binary if you're so inclined. ImageMagick is a powerful set of command-line tools for editing and manipulating images. Microsoft Office is sometime I use regularly, mainly for Word and Excel, and even PowerPoint on occasion. I have Outlook installed and used it for many years, but I now refer to it primarily to answer questions. Microsoft Visio is what I use to generate conceptional network and PC diagrams. I'm running Visio 2000 which, thankfully, works under Windows 7, 64-bit. Firefox is no longer my primary browser, but I do keep it installed as it's exceptionally convenient to refer to when answering questions or when a website is giving me difficulty. Parallels is the Virtual Machine technology that I use. I use it both on Windows, where I run additional copies of Windows7, Windows Vista, Windows XP, and Ubuntu Linux in virtual machines, but it's also the technology that I use to run Windows 7 on my MacBook Pro. Photoshop is what I use for advanced image editing and photo manipulation. PuTTY is a remote command line terminal program that I use frequently to get command-line access to my Linux servers. QuickBooks is for my business books. Skype isn't used often, but it's typically running as a way for trusted contacts to get in touch with me via voice or video. Sony Vegas Movie Studio is a more powerful video editing package than that which comes with Camtasia, above, and I use it for assorted video work. It's slowly being replaced with FinalCut Pro on my Mac. TeraCopy is a copy accelerator for Windows when using Windows Explorer. Besides speeding up copy operations somewhat, it also does a better job of displaying progress and providing options when conflicts occur. Vim is a text editor. It's older than dirt, dating back to the origins of Unix itself. It's wonderfully arcane and powerful, and available on every platform that I care to edit text on. I write my articles and books using Vim. VLC is my primary media player. It can play just about anything. WinMerge is a program that allows you to compare two text files and highlights their differences. World Of Warcraft. Yes, I admit it, I play WoW and have for several years now. It's great for stress reduction. My timing's erratic, but the BronzeBeard server is my home. xplorer2 is a dual-pane replacement for Windows Explorer. I prefer its more detailed user interface and the dual pane approach. It has many more features that I know I'm overlooking. I'm certain that I'm missing some items from the list, but it's a start. As you can see, I've amassed quite the collection of tools and utilities that I rely on over time. Some I use daily (hourly even) and some only occasionally, but all are useful. At least they're useful in some way to me. 1: Of course, my saying this will ensure that there will be a glaring error that proves that I cannot, in fact, alphabetize. I'll simply claim that those 'errors' are intentional so you have something to find. What do you install first? I recently had to rebuild my Window Vista laptop after a hard disk failure. Here's what I installed, and in the order that I installed it. Now that you're no longer a manager at Microsoft, do you really need Visio? And ImageMagick... It may be the most powerful image processing suite in the world, but it's also the hardest to learn. Would you really recommend it to any non-techie? ImageMagick is there for the command line utilities. Though I note that PaintShop Pro 8, my image GUI editing software of choice, is missing from the list :-). But seriously, if someone wanted to copy your list, what would be your recommendation for minimum machine specs? Or do you have a network set up with certain tasks assigned to certain computers? Just curious because that seems like a lot for one machine to handle reliably. Actually that list was comprised from walking the start menu on my "Primary" machine, so it just represents one of my several boxes. I expect that I'll add a few items as I check out a couple of other machines as well. My primary is a Dell 3Ghz machine with 2GB of RAM with an 80GB hard disk. These days I typically recommend 1.5Ghz and 1GB as a minimum for most machines, and that should handle the list as well. It's actually hard to get hard disks that are too small, but I'll stake out 60GB as a minimum in that arena as well. This is exactly what I wanted to see. A list of what the pros use. For what I do, I have had good luck with a lot of "stuff" you use. Paying heed to good recommendations from reliable sources sure makes choosing a lot easier. I wonder if you have played with AdvancedWindows Care from IOBit Software yet. I took part in the Beta testing and now run the free final version regularly. I was curious as to your thoughts on this software. It really seems to do good for me and my amateurish fumblings. Many thanks for your great advice in so many areas. I want to design a little gadget (like a calculator) with buttons, a display and numerical inputs. Ive got some experience of using microsoft infopath but thats forms and doesnt really lend itself to a gadget (although the logic design set up is really nice to use) i've also programmed in pascal but i dont really want to start from there. I havent got a clue how a gui would be designed from scratch either! Are IObit Softwares safe to use and why does Internet Explorer keep blocking the downloads and so does Kaspersky Internet Security 2008. Your assistance is highly appreciated and keep up your good work and regretfully more Microsoft Users should learn to know you. I am using XP PRO at this time and next year will plan to go to Vista. As you stated in your final line, you can not alphabetize, last time I checked Firefox comes before Microsoft in the alphabet. Now, chain yanking aside, this article has be very helpful, and except from some stuff that I just can't justify paying for no matter how little it is (trillian, WoW on the not so little side), I'm going to use this list as a base for all my new systems from this point on, which considering I already use things like Google Chrome and CCleaner (rarely), should not be to much of a transition. One piece of software you might consider looking at is BelArc Advisor, it's a free full system report. Now, it won't tell you whats wrong with your computer, but it will give you a list of any and everything installed on your computer, and any serial #s/product keys to go along with them. I do recommend it, though I don't install it on all my machines: Belarc Advisor - Detailed information about your computer's hardware and software. Of course my saying this will ensure that there will be a glaring error that proves that I cannot, in fact, alphabetize. That said, it's always nice to find out what other "experts" are using. I've downloaded the free version of WinPatrol, based solely on your "recommendation", to kick the tires. There's a lot of information to absorb in its listings. One program you use at least once a week is the program that sends out this newsletter. I was hoping to see what you used since your weekly newsletter has inspired me to write a similar format for my area of interest. So what do you you for your newletter and what do you use for your blog? Neither of those are programs installed on my computer (which is what this list is about). To send my newsletter I use a service called AWeber, and my site is built using MovableType. I wanted to like Quicken. I installed version 2010 and the first bank statement I received, I went into the ledger, clicked the Date column to sort my ledger and the items were in the reverse order of my bank statement. So, I clicked the Date column again to reverse the order and it wouldn't do it. It only sorts by date in ONE DIRECTION....GRRR. I contacted their customer support by phone, complained that GUI interfaces have been able to sort by ascending and descending order since the beginning and why doesn't 2010 do this? They had no answer so I asked when they'll be fixing this and they said they wouldn't. I uninstalled it and refuse to use it ever again. What (inexpensive) database programme would you suggest for a multi-user system to handle 60 competitors needing to choose between 100+ destinations, and assign transport to take them there (and back). I need user-designed report-generation. We have an Access 2002 system at the moment, but it's not very user friendly - and what we have was put together a LONG time ago by someone who is no longer available! You'll be gratified, I'm sure, to know that (unlike some people :D) I did NOT check your alphabetizing abilities. Interesting that you do not use Money for your personal accounting. Money 97 has been our program of choice since it came out. We tried a couple of the updates, but reverted because we liked 97 better. Have also tried Quicken but still like Money 97 better. Thanks for the article. Use many of the programs and appreciate the recommendations! I used Money for many years. Remember, I was on the development team for version 3. When Microsot discontinued Money I needed to move on to something that was being at least somewhat supported. the original question asked about buying programs and as the list shows most of what one will use are available as legitimate freeware. Because Revo does not handle 64 bit programs and because Advanced Uninstaller Pro 11 (freeware) does, is faster and has other useful attributes I find it preferrable. I like to use the W7 built in defragger for my data drive as the programs and o/s drive is SSD which does not need defragging. C Cleaner is very good for cleaning junk, checking and either enabling or disabling startups. Logs of startups and uninstal (installed programs) can be created and the Admins in PC Tech in Paltalk use these all the time when assisting users trying to do computer repairs. Malwarebytes is good to have and there are a number of others. 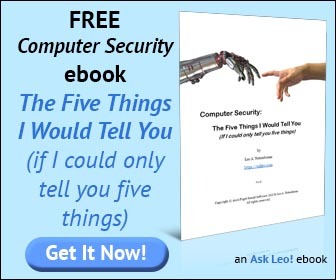 Amazing how much software we have in common - coudl it be because I have been suscribed to Ask Leo for (could it be?) fifteen years. Thanks for a good read and for peaking my curiosity about two programs that I don't use. 9 Years. And the newsletter's been around for 7. Some days it feels like much longer, though. Interesting about DVDFab. I used it for awhile, maybe 3-4 years ago, but it did a poor job of keeping up with the everchanging encryptions. Finally, I went with AnyDVD, and in all this time, it's not let me down at all. Just my take on the topic. Is there some reason you favor CutePDF over Bullzip? I thought I remembered CutePDF couldn't concatenate PDF files during the creation process, which is very helpful if you build a single PDF from multiple program outputs. The programs you use are excellent. However, the question comes to my mind: So many programs in your machine, won't they be using huge memory of your machine? I don't run them all at the same time. When not being run they don't take up memory, just a little hard disk space. Malwarebytes Anti-Malware is noticeably absent from your lists. I still use it and have snagged things with it that MSE missed. If I am not mistaken, you did recommend it at one time? I do have it, but I don't install it unless or until I have a problem that I think needs it. Most of those programs only run when you need them. When they aren't running, they only take up disk space but don't occupy RAM or use any other computer resources. Thank you for this list, I have been reading your advice for many years and I usually check out the software when you write about them. I now have many of the software programs you recommended on this list on my computers. I have saved this article in my ‘Important List’ Folder for future reference. What a help and relief they are when you run into trouble or need a certain type of program to solve a problem. I do have a few that you didn’t recommend, two that I find irreplaceable are Malwarebytes Anti-Malware and Keyboard Leds. You mention Microsoft Security Essentials but I read that it is not included in Windows 8. Will it still be supported for WIN 7 operators? Windows 8 comes with it own antimalware package included.Microsoft in their infinite lack of naming creativity, called it Windows Defender. It will be more like MS Security essentials than the old Defender. This is bound to confuse a lot of people. The many on your list that I do have I agree with. I am vaguely surprised at the omission of the Irfanview image viewer as Irfan has done such a heroic job of keeping it updated and expanding its capabilities, and I know it is immensely popular. IrfanView's a fine program but I find its user interface too clunky. You'll find Faststone Image Viewer in my list instead. I have tried CutePDF but switched to PrimoPDF because it gives me the option to select output size (screen=small, ebook, print, prepress=huge) and this is handy when I make a newsletter to be emailed. AFAIK these programs all have ghostscript under the hood anyway. I've been using anti-spyware SUPERAntiSpyware and Malwarebytes for some time, and they nailed a goodly number of "bad actors" at virtually every run. One day I ran Ccleaner first and the two anti-spywares right afterward. Result: zero hits for the latter. Later I ran the anti-spywares first again, getting a large number of hits. Immediately thereafter, without prior AS cleanout, I ran Ccleaner, and then the two AS programs again. Result: zero hits for both AS programs. My guess is that Ccleaner's removal of Internet temp files kills all (or at least most) of the nasty spyware, making subsequent AS runs unnecessary. I would like to see comments from other readers with their experiences. More often than not it's cookies. CCleaner explicitly clears cookies, and many anti-spyware programs report cookies to varying degrees of alarm - most cookies are benign. For someone who is not a real geek, this article, as with almost everything I read from Leo, guides me towards some of the more practical SW that is available and helps me understand what it does. in any case, I just like his modest style.